The Vale and Downland Beekeepers’ Association have a superb “Teaching Apiary” and also a dedicated “Beginners Apiary”. 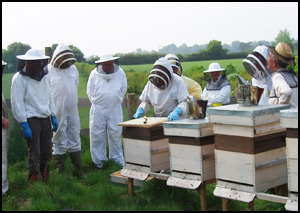 Both apiary sites are located near Wantage on farmland initially viewed by members late 2008. A Members’ working party started creating both apiaries early 2009 and in order to get the main “Teaching Apiary” up and running, equipment and bees were donated by members. The purpose of the “Teaching Apiary” is to provide education and promotion of all aspects of the craft of beekeeping to all members of the V&DBKA regardless of experience and also as a means of educating and informing the general public by the provision of “Open Days” during the season. Our teaching apiary is the main location where we can provide ‘hands on’ teaching, with practical demonstrations and an opportunity to discuss all aspects of beekeeping. Beginners have the opportunity to learn handling skills, best practice, hygiene methods, beekeeping techniques and a host of other topics and are able to ask for assistance or more information from other beekeepers with wide ranges of experience. At the “Teaching Apiary” assistance and knowledge can be given to those members who have been keeping bees for more than one year and who wish to further their knowledge to undertake the BBKA “Basic Assessment/Novice Assessment”. More information about the assessment can be obtained from the V&DBKA Exam/Education Coordinator. The teaching apiary currently hosts 14 working colonies for demonstration purposes. All hives have mesh floors with mite monitoring drawers below. We also have on display various designs of hives and equipment in order to give all beekeepers, especially new ones, a broad experience of the craft and to show the advantages of some equipment over others. As a beginner you will be encouraged to learn as much as you want to. We welcome beginners and members of the public and we can provide protective clothing for your visit. To assist and encourage beginners during their first year, a designated “Beginners Apiary” has been provided and can accommodate up to 8 members’ hives. 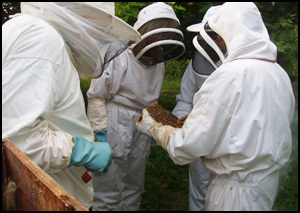 The beginners are able to gain confidence and practical experience in management of their own hives, starting with a nucleus and throughout a full season they will receive advice and guidance provided by the apiary managers and other experienced beekeeping members. All beginners will have previously undertaken an 8 week theory training course provided by V&DBKA and based on the BBKA “Course in a Case” module specifically designed for beginners. If you are interested in learning more complete the form on our contact page.